Dubbed as one of their biggest releases this year, VIP records will be releasing “Nakhra 2014” in the height of the summer with of a start of Sept release anticipated. “Nakhra 2014” has all the fundamentals required of a summer dance-floor anthem – a super strong beat and percussion, plenty of dance-ability and raw emotion within the vocal. But let’s take a step back for a second….You may be thinking “Deep Grewal? Who is this guy?”…and quite rightly so as this is his debut release – So who exactly is Deep Grewal and where has “Nakhra 2014” come from…. Having moved to the UK from Punjab 5 years ago, Deep is now based in West Bromwich, West Midlands. From an early age, Deep has had aspirations to become a singer in the Punjabi music industry. In 2014, Deep was introduced to Cloud 9 Music by a mutual friend and having recognised Deep’s talent, it was decided that Cloud 9 Music would begin to conceptualise Deep’s debut project. 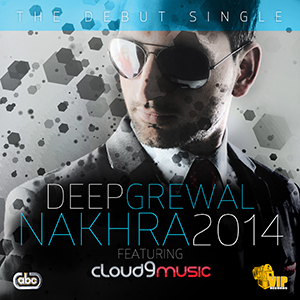 Since then, Deep has been working very closely with Cloud 9 Music to finely tune his vocals and working tirelessly to develop a style that could command respect within the Punjabi music industry – the result being the production of “Nakhra 2014”, which was written by J Roop Dinewal. Following the huge success of the “Ek Ek Saah” music video, Cloud 9 Music have once again appointed the talented cinematographers, Skylight, to create something magical for “Nakhra 2014”. “Nakhra 2014” will be available to purchase from iTunes and all other digital platforms upon release and promotional material of both the single and music video are expected to be available on all of the usual websites shortly.